Edit: Guessing is now closed. The correct answer is the Obj. 430. 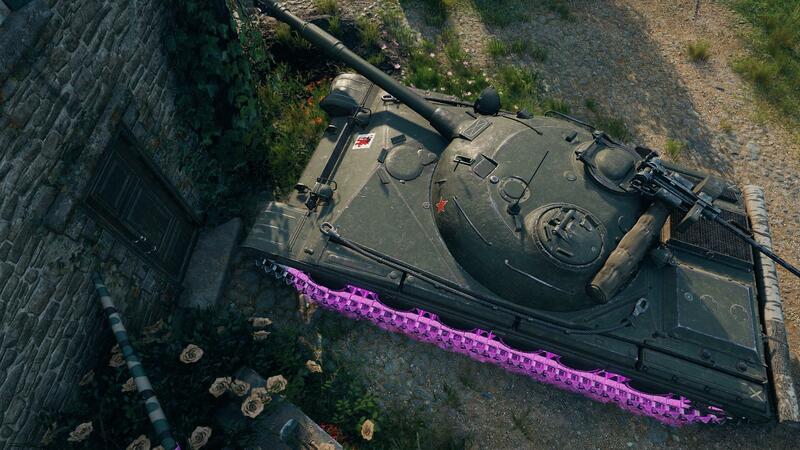 It's time for Guess the Tank! The rules are simple - I post a small part of a screenshot of a tank. Then, you have to guess which tank it is! I'll only reveal the answer after 3 people (or more) have guessed it correctly. After several responses, I'll say whether or not anyone has guessed the correct answer yet. If people are struggling, I'll post hints. Sometimes these hints will include a large part of the screenshot, sometimes they'll be a different screenshot altogether, or they'll just be a written hint. Every now and then, I'll give away prizes. Any such posts that have prize giveaways will say so in the title. This one is a regular post, so no prizes yet. This is the leaderboard. Every person who guesses a tank correctly before I close the Thread gets a point. If you were one of the first 3 people to guess correctly, you get 2 points (one extra). If you guessed it correctly before I posted any hints, you get a bonus point. What do the points do? At the end of a Season, I'll pick someone from this leaderboard to get a Tier 8 Premium tank. Ooh, exciting! Edited by Scorpiany, Mar 24 2019 - 03:24. Edited by Sam_Sanister, Mar 24 2019 - 02:29. I'll fix the spelling in a few minutes, and I'll upload the original image of the tank too. Edited by jamesdoz, Mar 24 2019 - 08:54.